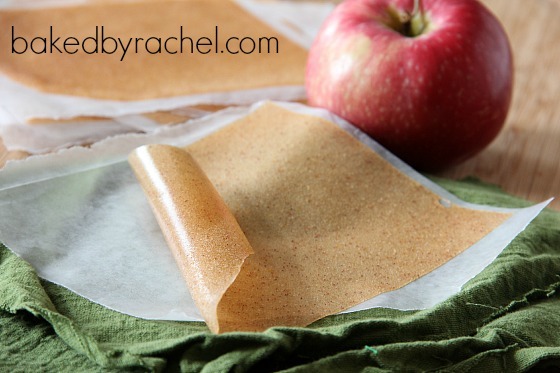 A recipe for homemade apple fruit leather that is both delicious and easy. Great for back to school lunches and afternoon snacks! I can still hear the store bought fruit strips being pulled away from their package. It’s the kind of thing you don’t forget. Or at least for me. Roll it up, rip it apart or just take a giant bite. I loved those things. I can practically smell the strawberry variety right now. A delicious childhood memory. I had little restraint when it came to those. I could easily eat an entire box if I wanted to. It only makes sense after making a cherry version that I would make an apple version. And let me tell you, this was incredible. Just the right amount of cinnamon and the absolute perfect texture. I wanted to hide them from the kids so I could eat them all myself! That good. My oldest has already requested I make another batch for school. I still can’t get over how incredibly easy this is to make. But best of all, the taste is fantastic and it’s a great healthy snack. You don’t need to question the ingredients either. Apples, cinnamon, sugar and water. All words you can say without stumbling over, unlike the long ingredient list of the store bought version. Yikes! 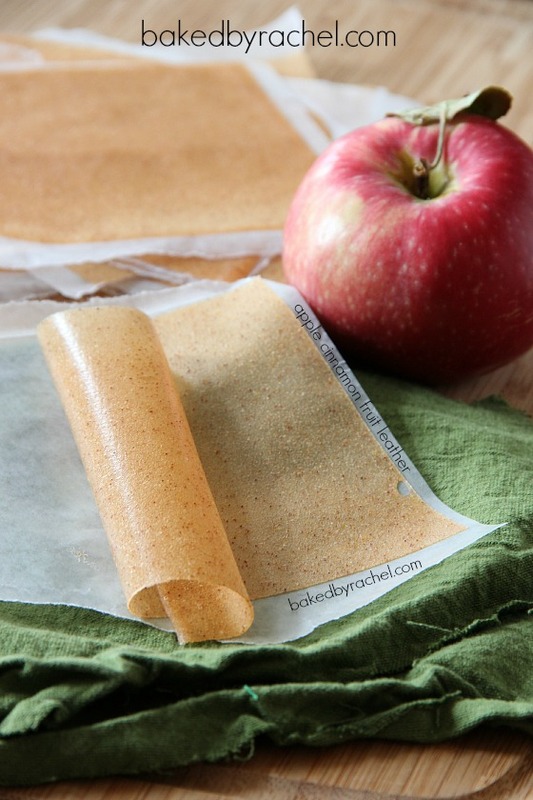 A recipe for making homemade apple fruit leather that is both delicious and easy. Preheat oven to 170 degrees. 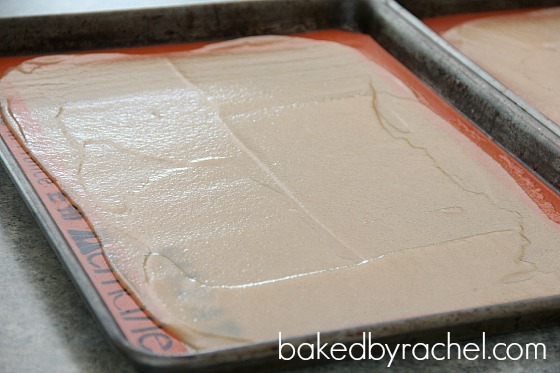 Line two baking sheets with silicone baking mats. Core and peel apples. Chop into large chunks. Toss in lemon juice to avoid browning while prepping the remaining apples. Add apples and remaining ingredients to a large saucepan or stockpot. Cook over medium heat. When apples are tender, use a potato masher to slightly mash the apples. Continue cooking for an additional 5 minutes. Carefully pour mixture into a blender or food processor to purée. Divide purée evenly between pans. Use an offset spatula to smooth out the mixture. Bake for 3 hours or until leather is slightly tacky and no longer wet. (*Time will vary depending on the thickness of your mixture.) Every hour, rotate pans 180 degrees and swap rack levels. Allow leather to cool before slicing. 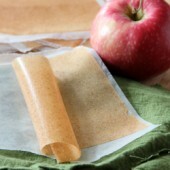 Using a pizza wheel or knife, carefully slice fruit leather into desired sizes. Wrap in wax paper. Store in an airtight container. -I used Paula Red apples for this. 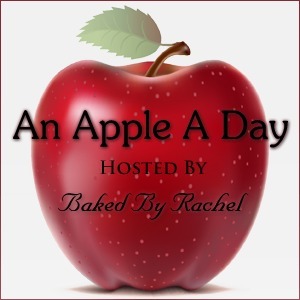 Use whatever apple you like best that has a nice flavor. -Boiled cider may be omitted from recipe if you do not have it. Alternately you may use apple cider or apple juice in place of the boiled cider and water.